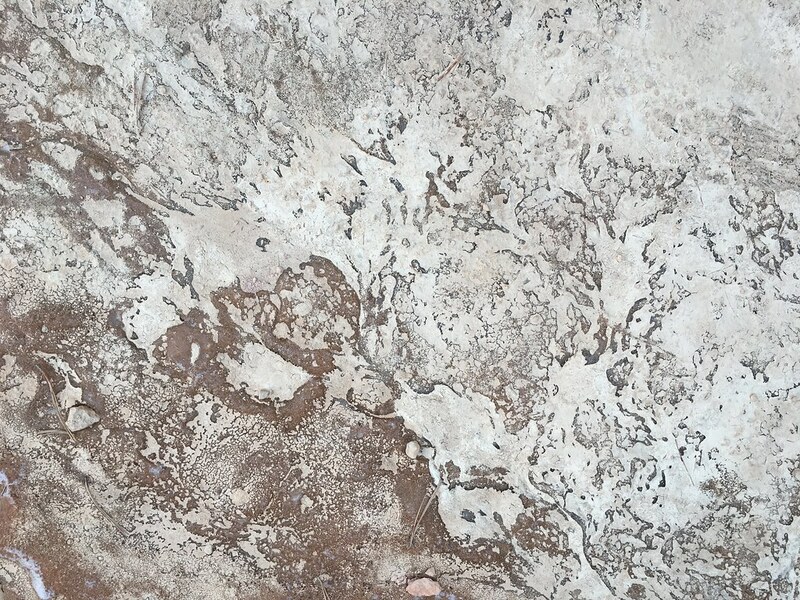 Notes from FoAM Earth's field trip to the Desertscapes of Arizona and Utah (020180304 to 020180330), marked by stark contrasts between heat and chill, adoration and dread, escape and extraction. We landed at the Sky Harbour around midnight. After a dazed stumble through the near deserted airport we found ourselves in a dark, semi-covered street, smelling of fuel and stale exhaust fumes. Deep shadows lingering in the air speckled with particulate dust, distant sounds of unseen critters. In a desert marked by stark contrasts between heat and chill, adoration and dread, escape and extraction. Our gradual attunement to the desert expanse, its climate, rhythms and scales became an experiment in communing rather than examining. An exploration of an embodied sense of layered time and material wonder. Being part of the world without romanticising wilderness or drawing hard distinctions between the desert and the urban environments within it. And so we embarked on that most archetypal of American experiences, The Road Trip. Attunement to the surfaces of the desert at the pace of modernity. Atypically, in a small (by local standards) hybrid car. An attunement at various speeds and human densities. Attuning to the smear of the landscape sliding past while driving, to the irregularities of the path while trail-running or hiking, to the sounds of the frosty ground and howling wind while walking. Along the Path of Time, where each step marks one million years. Down beyond the rim of the Grand Canyon, its scale overwhelming physically and perceptually, joining the intrepid 3% of the visitors who dare leaving the comfort of buses and paved paths. We would stop and listen. Seek out the faceted moments of geomediation at the Hermits Rest, after staring down The Abyss. Layers upon layers, Bright Angel Shale, Vishnu Schist and Zoroaster Granite. The Great Unconformity (an absence, a non-layer). The desert chirped and rattled and murmured, punctuated every few minutes by the roar of an airplane overhead, buffeting the chatter of birds, cracking of wood, or an argument between unseen humans. The effortless, unperturbed, lithic existence of the planet present in its apparent stillness. Here is the Stillness, which is not still even on a good day. Now it ripples, reverberates, in cataclysm. Now there is a line, roughly east-west and too straight, almost neat in its manifest unnaturalness, spanning the girth of the land’s equator. (…) The line is deep and raw, a cut to the quick of the planet. Magma wells in its wake, fresh and glowing red. The earth is good at healing itself. This wound will scab over quickly in geologic terms, and then the cleansing ocean will follow its lie to bisect stillness into two lands. Until this happens, however, the wound will fester with not only heat but gas and gritty, dark ash — enough to choke off the sky across most of the Stillness’s face within a few weeks. Plants everywhere will die, and the animals that depend on them will starve, and the animals that eat those will starve. Winter will come early, and hard, and it will last a long, long time. It will end, of course, like every winter does, and then the world will return to its old self. Eventually. (…) Eventually meaning in this case in a few thousand years. The spatial and temporal scales in the desert show themselves differently when experienced at speed. Driving through canyon country becomes a movie of geological magnitude. What began as a pale green plateau covered with the shy budding of early spring splits into dark jagged lines. A crack in the earth. The crack widens into a gorge and deepens into ravines. It splits open the landscape until the horizontal plateau disappears into the vertical crags of raw rock face. Geological scar-tissue as monument to the violent, persistent forces shaping the earth. Echoes of an era before the planet became hospitable to humans. A few hours (or moments) later time is adrift, scattered, discarded as it blows erratically along the roadside. The highway turns north into the Painted Desert. 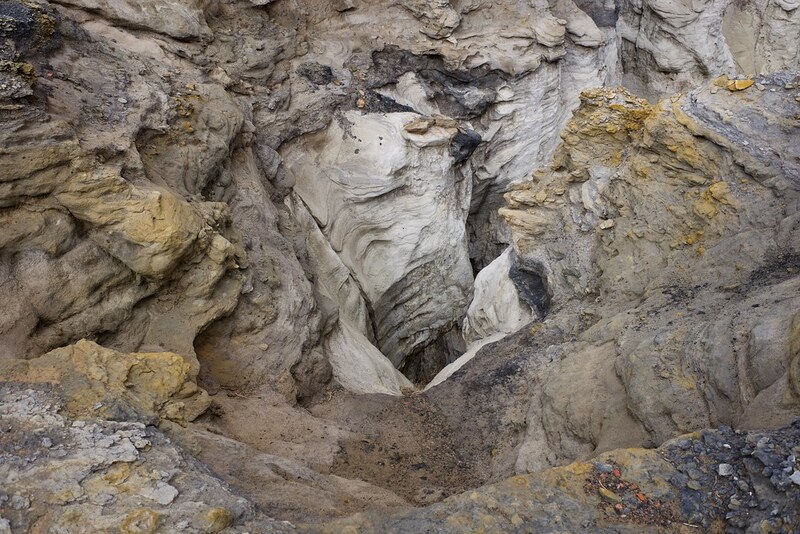 We glide through a gentler geological process — layered sedimentation of rock and sand and ash. Reds, pinks, yellows, purples interspersed with gradients of dusty grey, black and white. The dust of minerals layered with the dust of forests and crushed bones. From afar the hills appeared liquid, coloured with inks and turbulent water. We drove through time-scales in which rocks behave like fluids. 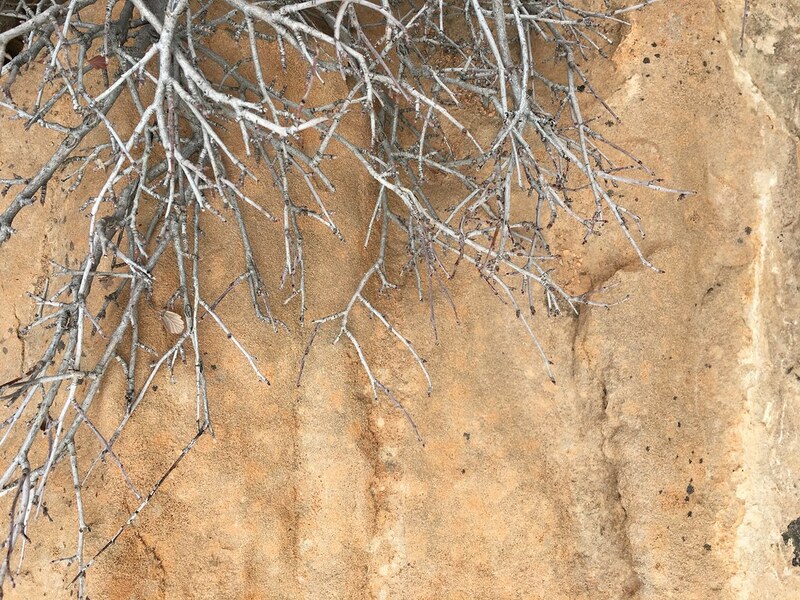 Layered time of fossilised erosion. 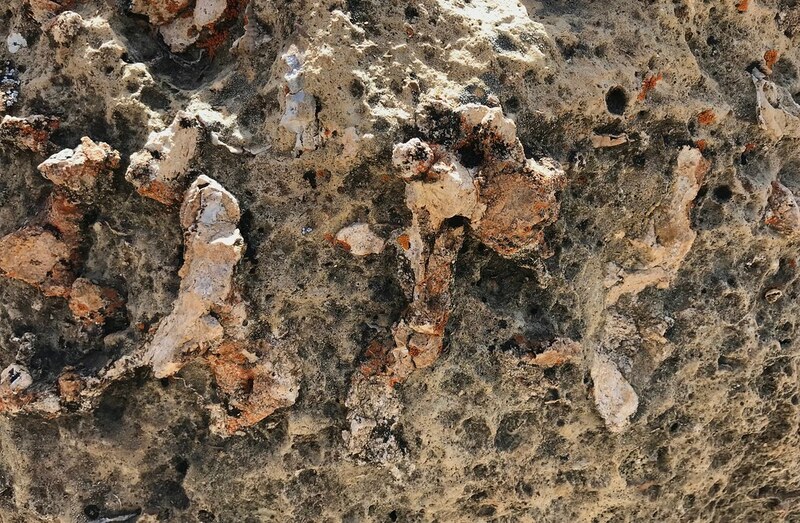 What might the thin layer of the Anthropocene look like, when sedimented atop those older layers, with hues of non-compostable plastics and industrial waste? What layers will come next? 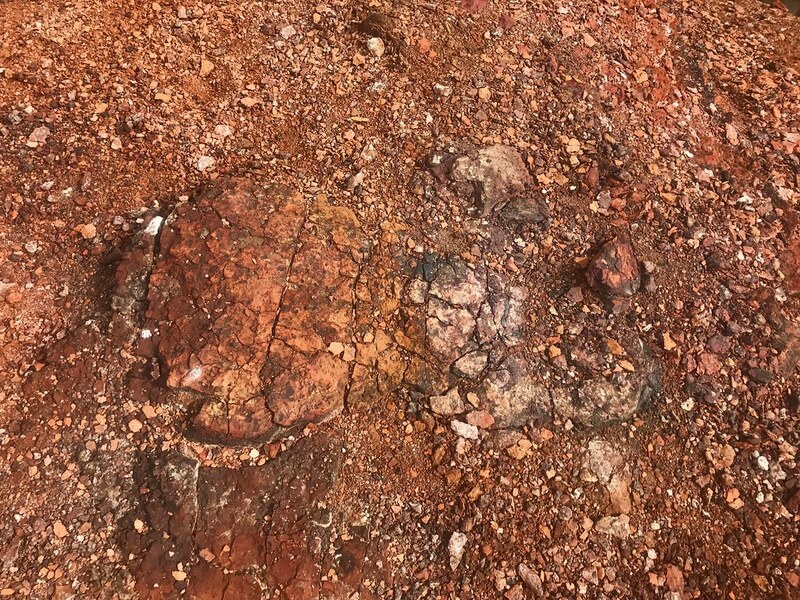 What could cover the remnants of the human-dominated sliver of deep geological time? The parking lot near Horse Shoe Bend was busy enough for time’s acceleration to the speed of gnats and twitching selfie sticks. We found ourselves in the wake of a Japanese hip-hop band, trailed by cosplay girls, followers in full regalia, teetering on the edge of the cliff on dainty high heels. Photogenic humans photographing photogenic topography. Attuning to digital mediation of experience of landscapes framed at screen resolution. No drones allowed. We were attuning to the Insta-desert, where moments of awe are mediated by cellphone photography and prescribed perspectives. In front of the legendary Antelope Canyon, our Navajo guide warned us that this is a spiritual place, where no-one (except flood water) should enter. Yet she ushered us in. Uncanny shafts of light framed by smooth undulating rocks guided our gaze as we scuffled along in hazy shadows. Thick drifts of dust stirred up by thousands of feet. 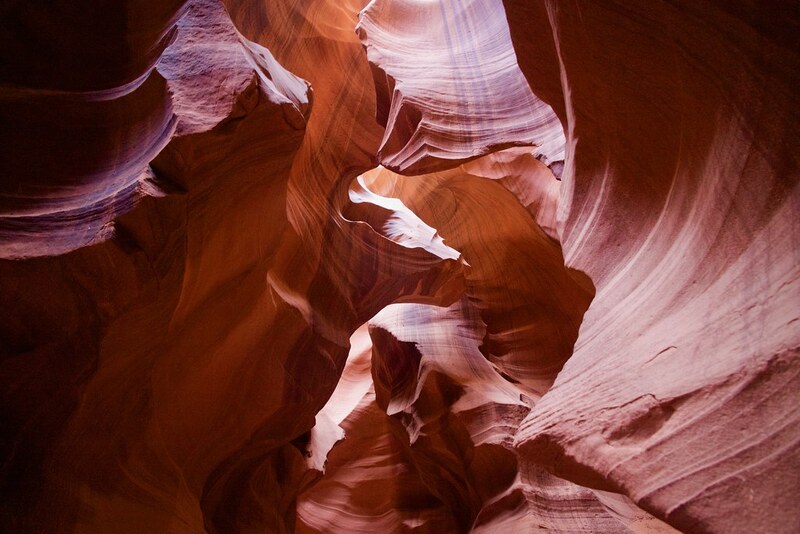 The perspective changed with occasional flickers of iron-ore coloured light, opening upwards into cavernous formations. Looking up, we could have been in the womb of the planet, all red and warm and smooth. Looking around, reds turned into dusty browns, pinks and ochres of human faces. Some bewildered, some quietly overwhelmed, others indifferent and impatient. A complicated tangle of humans cramped between unyielding rocks, compressed into the slotted time of a tour, rubbing shoulders with those who came before and after us. An attunement to the rhythms of desert tourism. 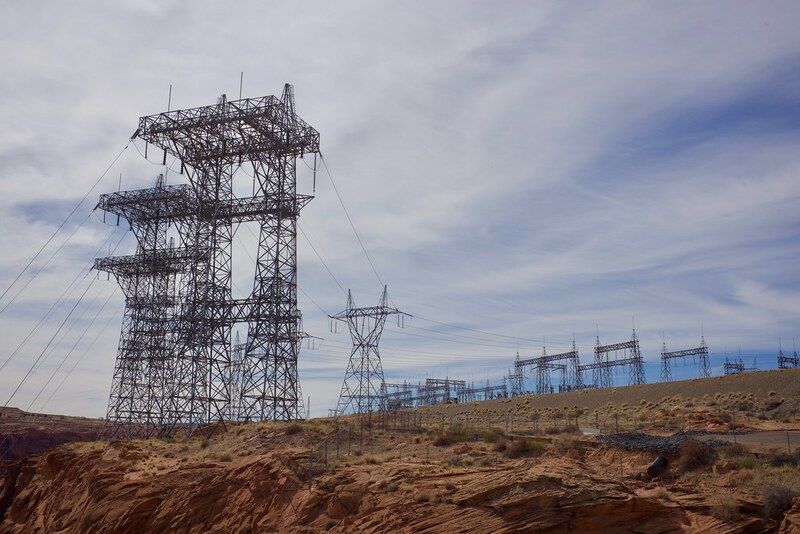 Squeezed into the back of a truck, we trundled past the Navajo Generating Station a massive 2400 MW coal power plant whose imposing structure rises from lands leased by the LeChee Chapter of the Navajo Nation. Its smokestacks and powerlines deeply embroiled with the desert. Salient signposts of dark histories, complicated present and debatable futures. 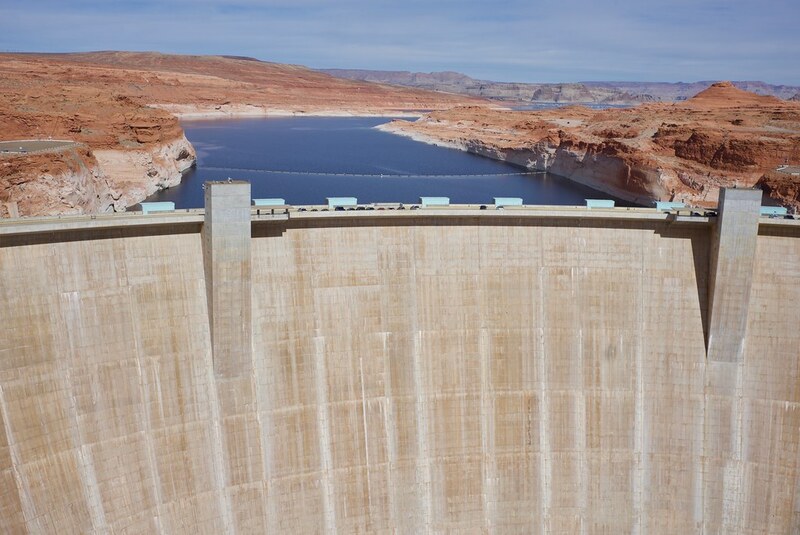 On our way out of Page we crossed the modernist megalith of the Glen Canyon Dam, a solid promise of progress with scant regard for the detrimental environmental side-effects. We stopped, listened, documented. This too belonging to desert attunement in the Anthropocene. 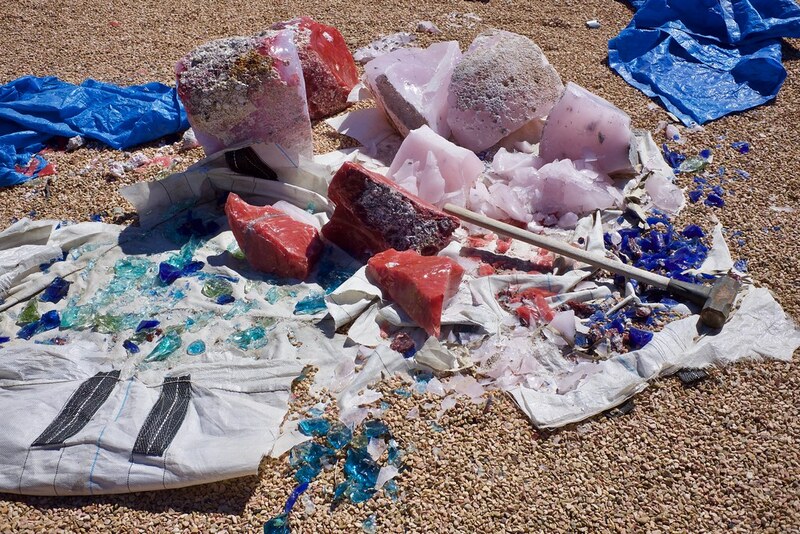 In the roadside Rock Shop, near Orderville in southern Utah, ancient minerals are broken into chunks, shards and pebbles, sold by weight, colour and size. We couldn’t resist stopping to marvel at the colours and textures laid bare in the bright sunlight. Obsidian, septarian, copper ore, bloodstone, sodalite, desert rose, amethyst geodes. Buying the Earth’s raw flesh from a geological wholesale butcher. We drove further north, to the edge of the desert. 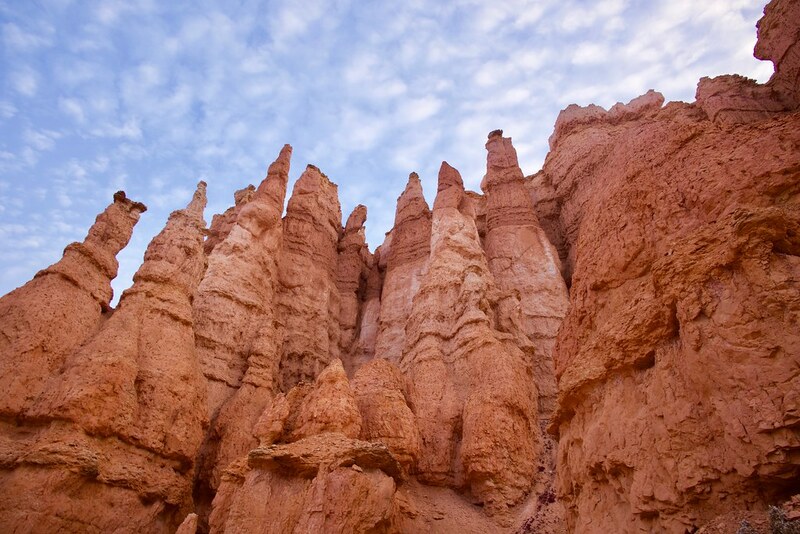 Bryce Canyon on the semi-arid Paunsagunt Plateau shares more with Scandinavian or alpine biotopes than what we were previously accustomed to in the deserts of the Southwest. We were greeted by snow, gnarly pine trees and crisp mountain air, contrasting with the pink and orange hues of the mysterious hoodoos. These ancient eroded rock formations extend over several natural amphitheatres like the stuff of myths. Hiking trails named “Queens Garden” or the “Fairyland Loop” encourage childlike fantasies and an easy anthropomorphising of the landscape. 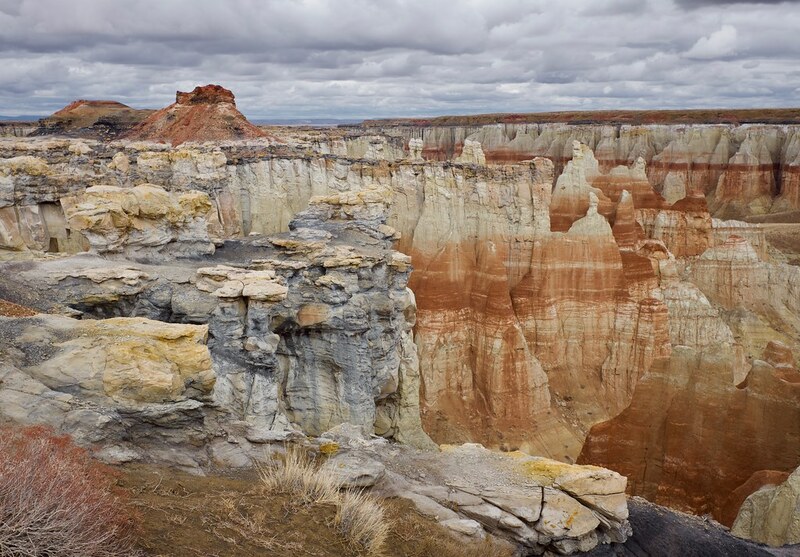 According to indigenous Paiute mythology, the hoodoos are remnants of greedy To-when-an-ung-wa, the Legend People turned to stone by the trickster god Coyote. A monstrous work of land-art cautioning against “living too heavily upon the land”. Through the bodies of the Legend People, with mud and snow sticking to our shoes we slid and slipped towards an empty riverbed, holding onto gnarly bristlecone pines. Their bark twisted and turned around the trunks, textured in convoluted alien scripture and secure handholds. Above our heads the wind played the needles and dry branches. To these otherworldly instruments we added the rhythm section, crunching frost and squelching sludge under our feet. 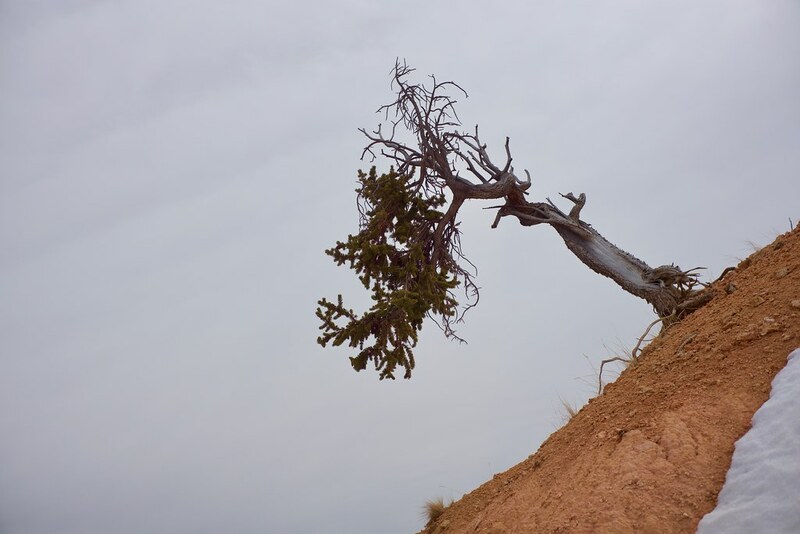 At the bottom of the trail, the wind stopped. Silence began creeping back into an already sparse soundscape. A drop of water. A solitary crow. A tiny crack or slide of a sleepy mountain. And then, the inevitable noise of humanity returned. The loud voices of jets. Trail runners. A particularly asthmatic motorbike in the distance soloing above the spluttering orchestra of ringtones and notifications. The invisible smog of noise pollution hovering over the still places cloudlike. We travelled onwards under thick cover of clouds. 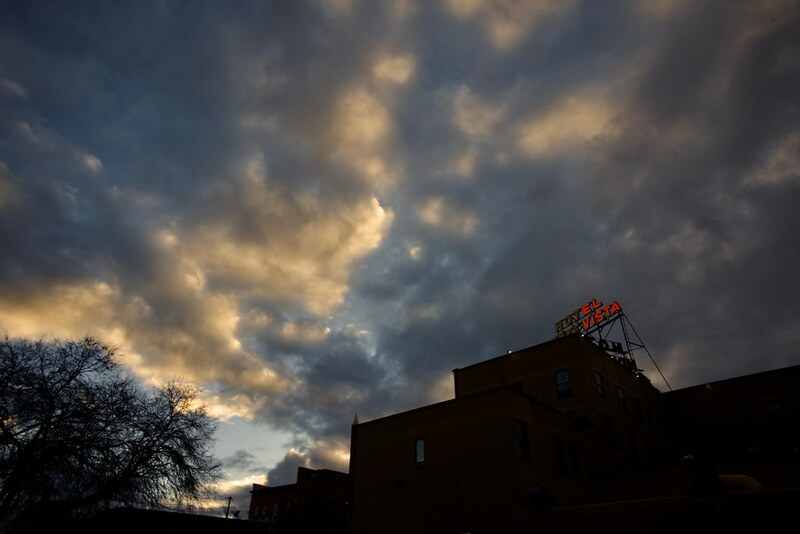 Storm clouds. Dust clouds. Clouds of invisible pollution. What appeared as pristine desert could harbour an atmosphere filled with airborne toxic dust and deadly ground water. 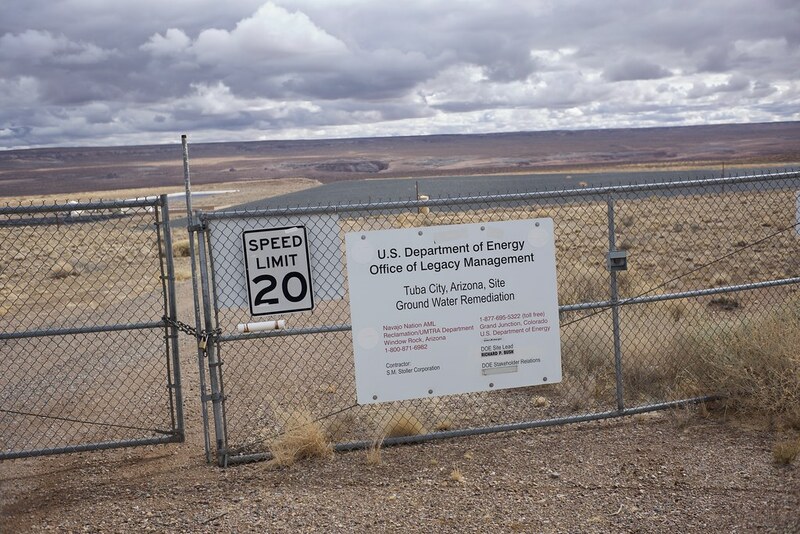 We followed clues from the Center for Land Use Interpretation, driving through Tuba City, a town that was known for its uranium mill from 1956 to 1966. The scars both visibly and invisibly remain. Attuning to this landscape lead to halting conversations, prolonged uneasy silences, a hollow taste of unseen dread, skewed injustices. Just outside the town we found the eerie Uranium Disposal Cell. Framed by barbed wire and DOE warning signs, the Cell is a hermetic dull scar, far from the spectacle of “Atomic City” (neither Las Vagas or Los Alamos nor Midway), uniformly dark grey and rectangular cut into an amorphous arid plateau, geometrically attempting to outlast the half-life of uranium. In stark contrast to the nearby Coalmine Canyon, whose contours continue to change over time, sculpted by erosion into gracefully intricate carvings. The blacks, reds, yellows and whites extending into the depths beyond sight. A temple of lithic giants under a brooding sky. Worshipped by flocks of crows and an occasional human. Dark clouds covered the sky as we began the slow descent from the Colorado plateau. We followed miles of power lines and fences, occasional churches emerging from the mirage of an endless road. No sunset crater, no marble canyon and no condors. No dusk recordings. Instead, the highway framed in icy rain lead us to the creature comforts of Flagstaff. The historic Monte Vista hotel celebrating its famous guests alongside ghost stories and disturbances (when John Wayne met The Phantom Bellboy). Craft beer and pizza. Motion sickness pills and The Broken Earth. 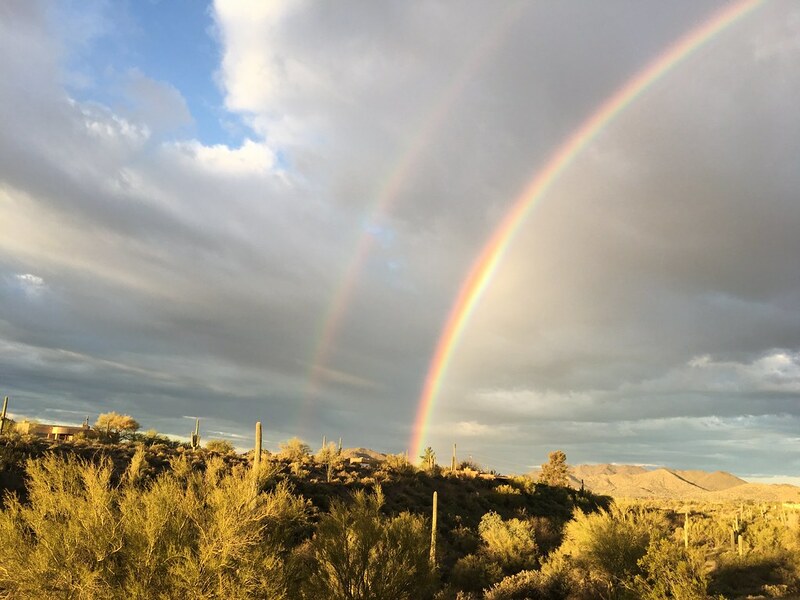 The next morning, as we returned to Saguaro country, the clouds parted and temperature rose. We continued our deceleration from 5000 miles in a day, 1000 miles in a week to one mile in 10 days. We arrived and we stayed put. We listened. 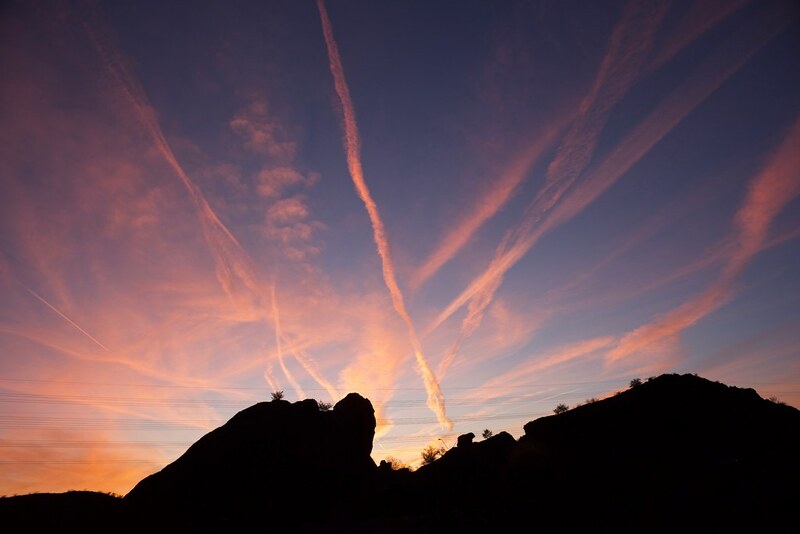 Experiencing the desert at 0mph, as the warm light of the afternoon intensified into a blood-hued sunset, the fading cool shades of dusk, until the pinprick starlights began blinking into existence, scattered across the desert sky. The longer we remained still, the more frequently our neighbours visited. Humming birds, lizards, insects, crows, a pack of coyotes, deer, javelina, even a solitary shapeshifter. The nocturnal scuttlings of unseen beasts. The brutal nonchalance of bats eating crickets. A mundane spectacle of the everyday, indifferent to our arrival. Amidst this teeming habitat on the edge of urbanity, we eavesdropped on incomprehensible conversations of animate matter. 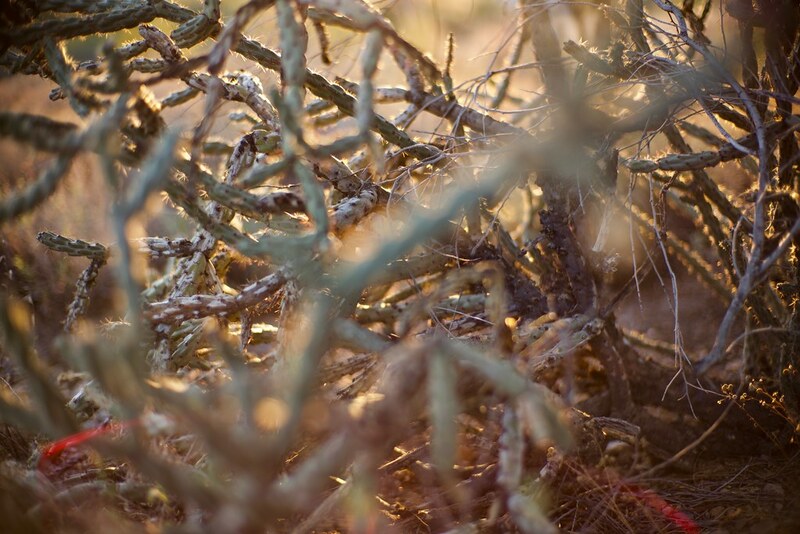 Dust and cacti, trees and insects, concrete and sunlight. We wondered what the thalient voices could tell us about the place. What speculative technologies could provide a way of communicating (or communing) that humans could better comprehend? We can pay attention. But attention is a scarce resource. What technologies could help with attunement to our surroundings, rather than distracting us away from them? How could we help ourselves listen to the entities we share the planet with? We unpacked our technological helpers and spent several days listening to the desert with our own ears and through a range of microphones, headphones and speakers. We began to learn the subtle variations in daily routines of plants and animals. 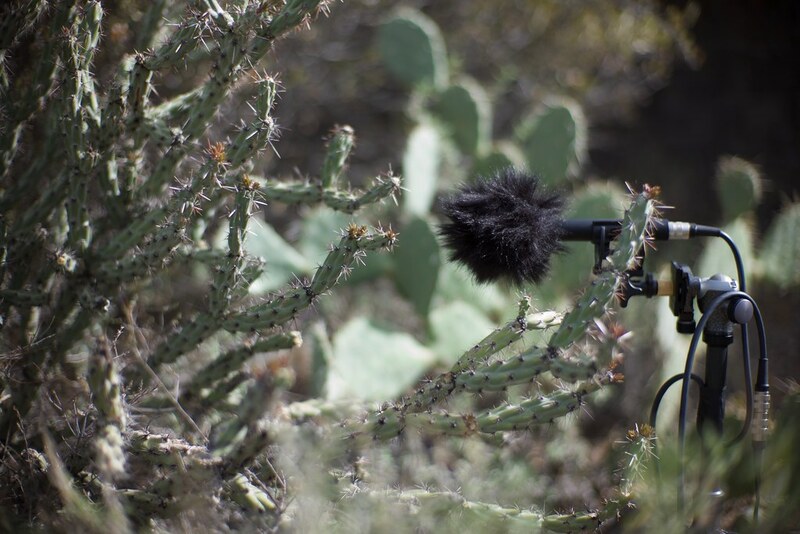 We explored the sonic textures of cacti, Palo Verde trees and creosote bushes, listening to the wind on their skin and caressing surfaces with sensing devices. We experimented with directional and ambient recordings, deliberate and incidental sounds. The mighty Saguaro, the dawn chorus, omnipresent engines, and the occasional droning of military helicopters in urban training exercises. Woodpeckers playing metal chimneys, thrashers mimicking police sirens, howling conversations between dogs and coyotes at dusk. Above and through it all, vast geological scales cast their long shadows, imposing a silent, harsh indifference. As our technologies became our conversation partners, we summoned entities from the software realms, to interpret, translate, juxtapose and convolve the many overlapping voices. We heard new patterns emerge, cut through by fictocritical yarns woven by our human guests. Our composition would become an impression of this urban desert as it is and as it might be, from multiple perspectives, with all of its voices heard, but not necessarily understood. Over time the sounds emanating from the computers blended into the sounds outdoors and the embryonic ones in our heads. The voices of the desert haunted us even in our dreams. Temporarily inhabiting a building that blended into the environment enhanced our immersion further. "Our buildings are designed from the outside in and the inside out such that their form is a reflection of spaces within and never just form for form’s sake. An authenticity of material choices and rigorous detail resolution carry the logic of ‘making’ and provide a weighted connectedness to place… …all our senses are alerted and nourished. Our curiosity is piqued, our time and place is reflected and respected in unexpected ways. Our minds are opened to new ideas, our confidence in the possibility of the human endeavour renewed. We feel comfortable yet challenged, understood yet urged to stretch. We want to be in such places alone and together with others. (…) We want such places to serve as markers of our best efforts. We want such places to exist beyond our lifetime." On a tiny staircase connecting the circular Kiva with the desert, stood an abandoned statue of Kokopelli, the trickster god of fertility, agriculture and music. An auspicious coincidence. We placed two bowls in offering. A bowl of water and a bowl of creosote branches. When moistened, the oils in its rough leaves emit a scent reminiscent of the desert. Dry, bitter and pungent. A scent announcing the season of replenishment and renewal. "Action on behalf of life transforms. Because the relationship between self and the world is reciprocal, it is not a question of first getting enlightened or saved and then acting. As we work to heal the earth, the earth heals us." By living on the edge between the desert and the city built within it, our workflow gradually attuned to the rhythm of our temporary habitat. We’d wake up before dawn, together with the morning chorus of wildlife and motorised vehicles. Sunrise would bring about a marked sense of acceleration, in response to the intensifying light and temperature. Our work flowed alongside insects and birds busying themselves with their daily chores, until mid afternoon. Then everything and everyone around us seemed to decelerate. We followed the example of the reptiles lazing atop scorching rocks and would take a break during the hottest part of the day. As the sun began its descent, the pace would pick up again, in and around us. We worked in a state of productive flow, characterised by concentration and deep absorption, whether we were designing, composing, programming, cooking or writing. After dusk, the diurnal critters exchanged places with the nocturnal ones, air traffic lessened and we’d drift from productive to reflective, until the hushed atmosphere of the night encouraged sleep. With the experiments in desert attunement our creative process began to merge with the spatial and temporal qualities of the surroundings. A strong aesthetic resonance with the organic architecture of our workspace and the shimmer of the landscape. Yet the sense of being surrounded by boundless desert was an illusion. Our attempts to walk further than a few minutes in any direction were soon hindered by visible and invisible fences. There are few traces of walking here. The only suggestions of habitation were traffic noise, warning signs and the occasional flashes of light reflected off distant surfaces. A place of beauty devoid of human contact. 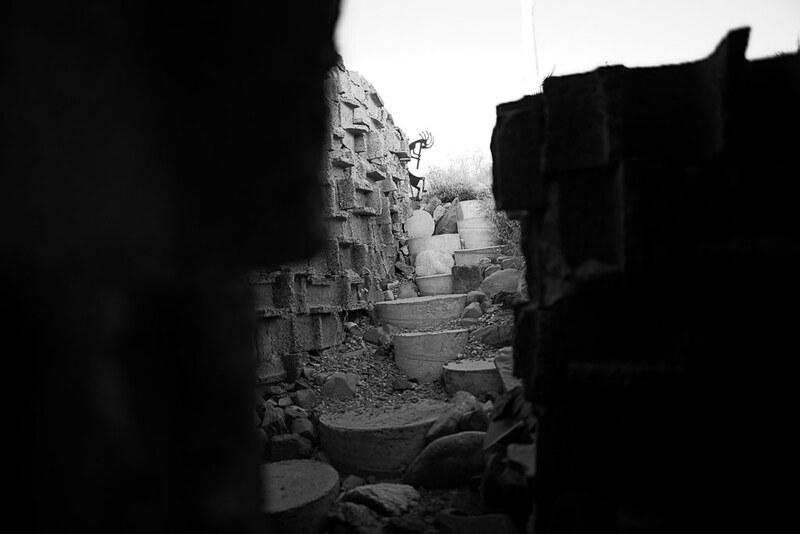 — Joanna Walters, Plight of Phoenix: how long can the world’s ‘least sustainable’ city survive? Back in Phoenix. Within minutes of our arrival we were attuning to time dictated by business hours rather than cycles of daylight. Time as a commodity. Linear time, always slipping into the past or the future, just out of reach. We were tuning to the visceral sensation of running out of time, accompanied by the obvious methods of continuous partial attention, rapid context switching and chronic busyness. We were lured into feelings of restlessness, characterised in equal parts by numbness and hyperactive anxiety, a turbulence leaving heartfelt aspirations in its wake. Our daily rhythm felt more like a halting state, stopping and starting, a stochastic changing of gears in intermittent traffic jams. Time was scarce, yet space appeared abundant. Commuting could easily devour several precious hours each day, through an urban landscape extending for miles in a relentless sprawl of city, suburbs, exurbs. Phoenix is populated by millions of humans, with no sign of their fossil-fuel dependent lifestyles changing any time soon. Cars remain a dominant feature of the landscape. 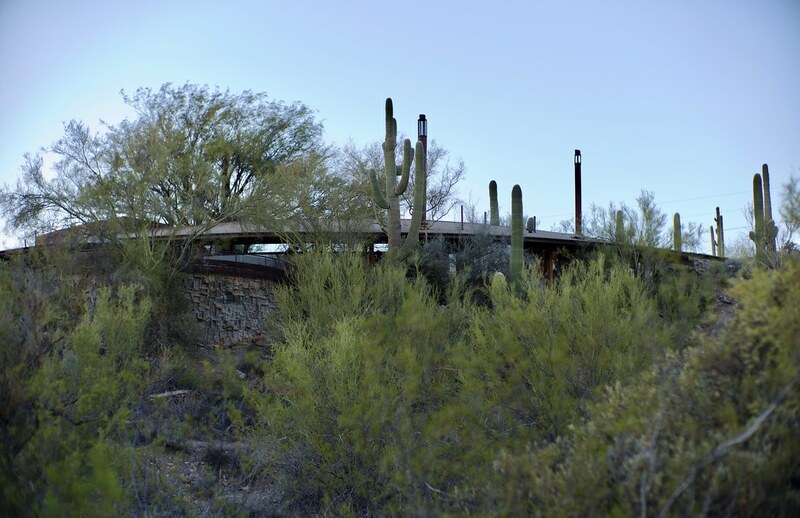 Architecture gradually transforming its desert environs. Experiencing the city while driving in air-conditioned cars and trams attuned us to the deceptive scales of environmental and social problems. Yet when we stepped out and walked, we noticed small but promising pockets of change, growing like persistent weeds through the cracks in the pavement. Collectives and co-operatives working to transform their neighbourhoods one lot at a time. We walked through downtown Phoenix, across Tempe campus, through farmers markets and desert parks. While walking, the rigid layout of the urban grid is occasionally softened by unexpected encounters. The warmth of human contact rekindled by acknowledging each others’ existence. An occasional smile, a simple compliment, or even a mumbled apology when inadvertently bumping into a fellow walker would re-establish a sense of conviviality. What ensued was a predictable mix of outrage and the sounds of a corporation distancing itself from responsibility. The opinion machine cranked into action. Blame was thrown around casually, solutions were promised, tests suspended, technological progress was declared inevitable. A clear pharmakon, with technology in an ambiguous simultaneity of problem, solution and scapegoat. Yet the doubts remained. Doubts about possible futures and the disjointed present, the urgency of significant change and the disproportionate insignificance of action. Elaine Herzberg was the first pedestrian killed by a self-driving car, joining other women remembered primarily for their misfortune at the mercy of machines. In particular, Bridget Driscoll, the first recorded death of a pedestrian caused by an automobile in 1896 and Mary Ward, possibly the first fatality caused by a motor vehicle in 1869. While these women will be remembered as victims, there extends a mass of anonymous humans, animals, plants, lands, insects, microorganisms and macroscapes who continue to be sacrificed on the altar of speed. In a city committed to acceleration in whichever direction the disciples of innovation suggest, urban walkers (and other n-peds) are an odd species. Yet Phoenix is also home to the unique Museum of Walking (MoW), “committed to people, land, action, and site through the everyday act of walking”. In Phoenix walking can feel like an act of resistance or an act of hope. Purposeful walking and aimless wandering alike. So, as guests of the MoW, we invited inhabitants of our host city for a walk. A soundwalk, a form of contemporary geomancy. A pretext to re-discover aspects of their home and possibly glimpse alternatives that wouldn’t have been visible otherwise. An embodied reading of the landscape as it is and as it could be. Worldwalking, worldknowing and worldbuilding together. Accompaned by the constant hum of cars and insects, beneath a busy flight path. We crossed the threshold into the Moeur Park, a dim tunnel under a busy highway, decelerated, listening. The soundscape was subsumed into the deep drone of traffic. Walking slowly, in single file. Waiting for each step to find its footing, until all the senses became engaged with exploring inner and outer landscapes, simultaneously. We traced the edges of the city and the desert, attuning to their complex rhythms and relationships. Rhythms above and below, sharp interludes. Along a path beset by the spectre of an abandoned railroad, hollow and dusty. Snaking along a resonant ridge haunted by jet engines in the wind. Climbing through an outcrop of boulders, hearing the rustling of sparse undergrowth. Aswarm with critters signalling. 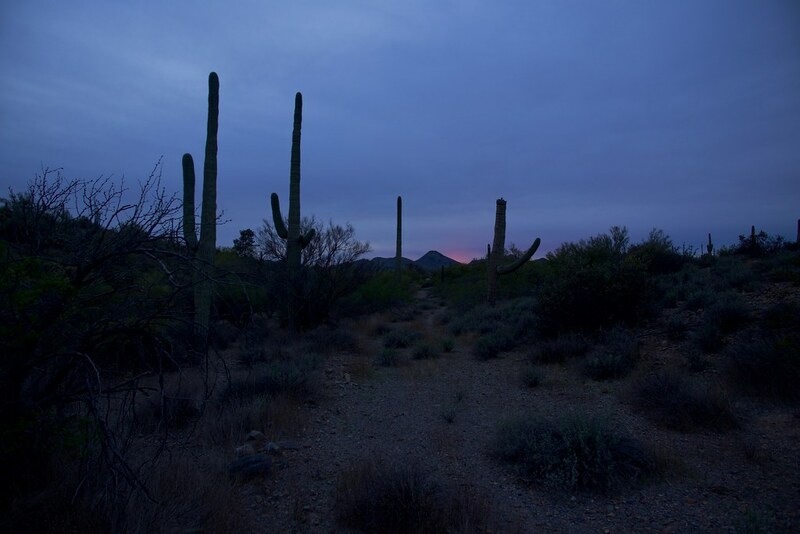 Absorbing the desert expanse at dusk, in The Silence of the Cacti. A gentle turn revealing urban soundscapes of civilisation in collapse. Hushed darkness cut through the eerie river of tail-lights. A descent, into the dripping, budding and chirping of early spring. The hollow dryness of a bustling desert, gradually receding into the night, unseen others, uncanny and quiet. We let our minds wander, spinning new yarns, possible lives lived otherwise. Of vapour trails writing their poetry in the colours of sunset. "As philosophers, our job is to amplify the black noise of objects to make the resonant frequencies of the stuffs inside them hum in credibly satisfying ways. Our job is to write the speculative fictions of their processes, of their unit operations. Our job is to get our hands dirty with grease, juice, gunpowder, and gypsum. Our job is to go where everyone has gone before, but where few have bothered to linger."